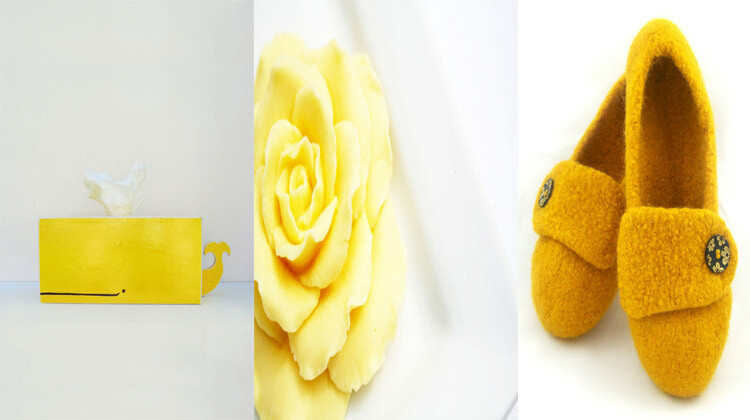 Brighten up your day with a dash of yellow! Representing the brightness of the sun, hope, cheer, laughter, knowledge and enthusiasm, it’s no wonder this illuminating color is much needed in stressful lifestyles. With our handy guide of all things yellow, discover the many lively yellow items from Etsy artisans. Since yellow represents creativity as well, these professional crafters have certainly used the magic of yellow to create wonderful products that make great gifts for friends, family and yourself! Add a little sunshine in your life with one of these handcrafted goodies, and reap the benefits of having yellow as part of your life! Embellish your everyday attire with The Little Chickadee’s honeycomb print pendant necklace! 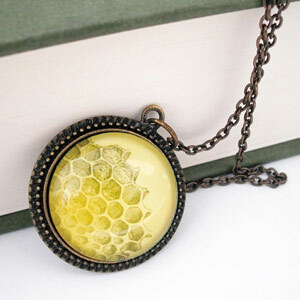 The rich yellow honeycomb print is a vintage illustration that has been made to be this necklace’s main star. With an 18-inch chain, this necklace falls beautifully below your neck for an elegant yet quirky touch. You can also choose another chain length for this necklace. This necklace is a great gift for nature lovers or history fanatics. 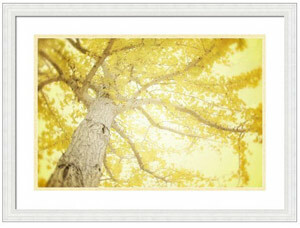 Brighten up your home with Amy Tyler Photography’s yellow tree photo! Featuring the underside of a yellow Ginkgo leaf tree, this photo is a great way to add a ray of sunshine in your home or give it as a gift for the nature lover in your life. This photo print comes in three different sizes: 8×10, 8×12 or 11×14. You can also have smaller or bigger prints made with special, customizable listings in Amy Tyler Photography’s shop, such as this one. Give any box of tissue a makeover with Sparkly Pony’s wood-made, whale-shaped tissue holder! Perfect as a teacher’s gift or for your own office, this whale tissue holder presents a creatively made tissue release hole from the whale’s blowhole. 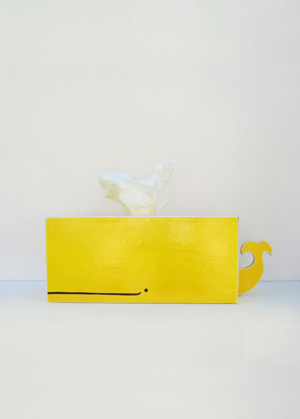 The whale tissue holder has been painted with a rich yellow color and makes it easy to clean with a simple damp cloth. 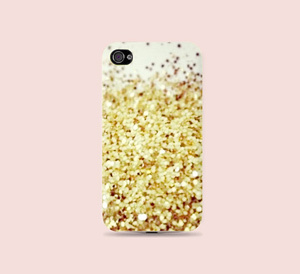 Make your phone sparkle with Cat Cheese Case’s glitter phone case! iPhone and Samsung phone holders can enjoy this glittery phone case as it comes in sizes for many phone styles, such as iPhone 4s and Samsung Note 2. This phone case comes in two different styles — matte hard case and glossy hard case — and has the golden glitter image printed on the case completely. Keep stray hairs back with Neeka Knits’ turban headband! Coming in a golden yellow color, this headband is knitted with a soft wool roving and cinched in the middle for an added style. Whether for your everyday wear or for just at home, this versatile headband can accompany you anywhere! When life gives you lemons, wear them! Constant Baubling presents charming, miniature lemon slices in stud earring form. This pair of lemon slice stud earrings is made with clay-made lemon slices and surgical steel posts. 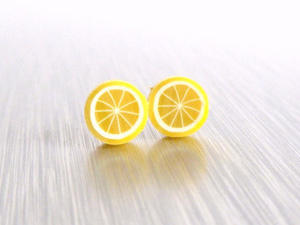 Whether casual or formal, your outfits will have a little cheer to them with these lemon stud earrings. Give your coins a new, cutesy home with Misala’s yellow duck coin purse! 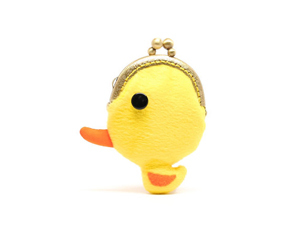 This adorable purse has the head of the duck as the main coin storage, and the smaller body of the yellow duck adds a whimsical touch to this coin purse. Surprise everyone around you when you whip out this unexpected coin purse from your handbag! With a kisslock frame, this coin purse opens and closes easily. Instead of red rose petals, enjoy your next bath with Sakura Bath & Body’s luxurious lemon yellow rose soap! 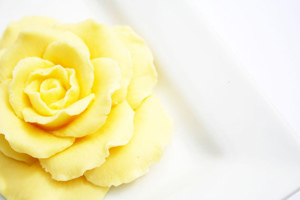 Scented with a fragrance blend of spring flowers, this yellow rose soap has been beautifully molded into a breathtaking, intricately detailed flower shape. Romantic and bright, this lovely rose soap makes for a fantastic Valentine’s Day, anniversary or birthday present for your special lady. 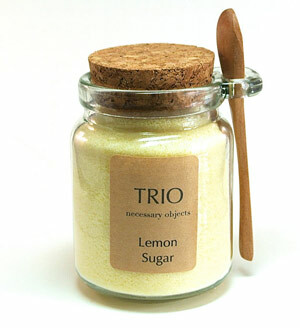 Add a burst of citrus-y sweet flavor to your teas, baked goods and more with Trio3’s lemon sugar! Made from natural cane sugar and lemon zest, this light yellow lemon sugar is sure to add a lemon-y twist to any of your favorite foods. This lemon sugar comes in an 8-ounce cork lid jar and a wooden spoon, which make this lemon sugar jar an excellent hostess gift. Keep your books neatly organized with Design Atelier Article’s lemon slice bookends! Laser cut from quality metal, these lemon slice bookends add a quirky touch to your home or office space. 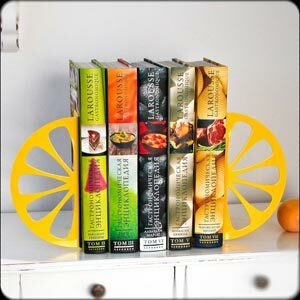 You can use these bookends in your kitchen, as lemon slices are quite fitting for it, and keep your cookbooks organized and together in one place. Give your jewelry collection a personal touch with Dekel Designs’ monogram necklace! This necklace comes in yellow gold and can be personalized with any initials you desire, whether your own or a relative’s. Necklace chains for this monogram pendant include 14” to 22” chains. 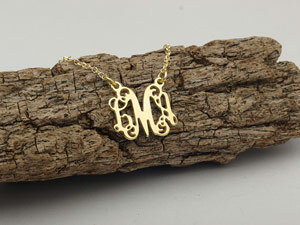 With a flowery, cursive font, this monogram necklace adds a touch of elegance as well as personality to your outfits! 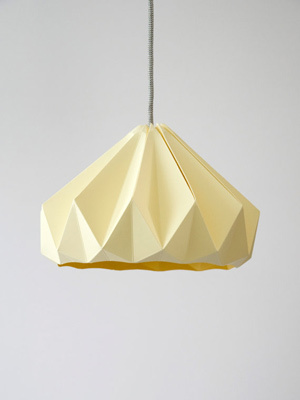 Modernize your home with Studio Snowpuppe’s origami lampshade! This lampshade is made with a special type of paper known as Butterfly, which gives this lampshade a long lifetime. Use an energy-saving light bulb with this lampshade to let your room shine with a cozy glow. With the curved, modern design, this lampshade adds a unique appearance to your dining room, kitchen or office. Give your bouquets of flowers a new home with Carriage Oak Cottage’s yellow ombre vase! Crafted from a cement and stucco mixture, this vase presents a bumpy, rustic appearance underneath the paint. Perfect for a sun room or dining room, this yellow ombre flower vase brings more light to any room! 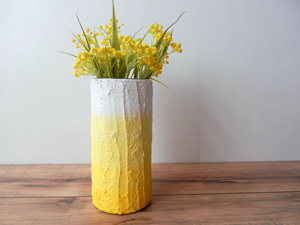 You can also turn this yellow ombre vase into a special gift for the gardener in your life who wants to treasure his/her cultivated flowers or as a wedding gift for a nature-loving couple. 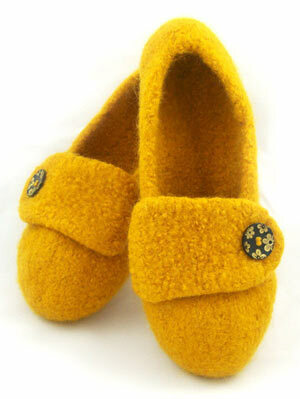 Stay warm and stylish with wild Tree Design’s felted wool slippers! These slippers come in a rich, golden yellow color and has a single floral button on each slipper, which gives these slippers a whimsical, feminine touch. All you need to do is slip your feet into these slippers, completely hassle-free, and enjoy their warmth on those cold days! Keep your knitting yarn together easily with Karo Art’s knitting bowl! 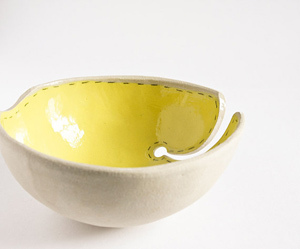 Made from stoneware clay, this sturdy knitting bowl presents a light yellow, glazed interior with a simple beige exterior. A slot for the knitting yarn to come through has been added to this bowl along with a slight dip on the edge of the bowl to rest your knitting needles. Even though this bowl was essentially for organizing your knitting materials, you can also use this bowl for other purposes. Yellow, especially a pale, pastel yellow, is a wonderful nursery paint color, so if you’re a mother-to-be, consider using yellow as the main color in your soon-to-be newborn’s nursery! What’s great about yellow is that you can pair it with other colors as well, such as navy blue and light grey, for your nursery theme and design. What better way to welcome your newborn than in a sunshine-filled room? Be sure to check out our other Color Chronicles for red and orange! Our green Color Chronicle is next, so be sure to check it out soon!